Sentries await traffic at the main gate during reconstruction works on the Prince Gong Mansion in November 2007 AD. 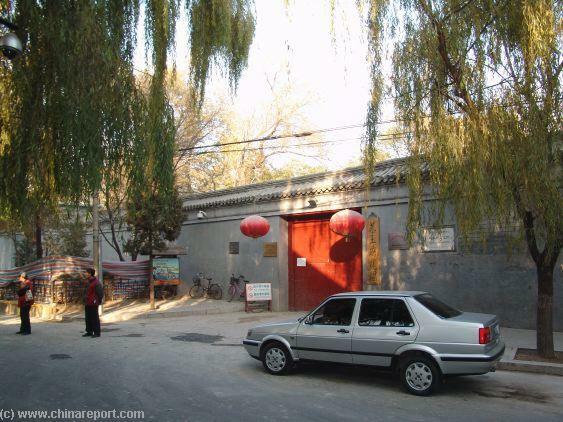 The Mansion of Prince Gong is the largest of the few remaining Royal Mansions in Beijing that are open to the Public. On top of this it is also reputed as THE Palace upon which the lush Imperial backdrops of the famous 18Th Century Chinese literary classic 'a Dream of Red Mansions' were based. Hence, it is a popular tourist site. 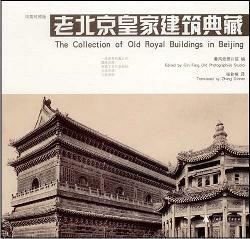 "The Collection of Royal Buildings in Beijing"
to follow Liuyin Street up to the Prince Gong Place Gate. A view of Liuyin Street along which the Main Gate of Prince Gong Mansion is located. northern section was reserved for the uppermost layer of society. They were living just outside of the Palace proper and formed the first ring of the subject citizenry surrounding the Emperor and his immediate circle and family. Actually, much alike the situation with the current Government in Beijing who reside at Zhongnanhai and selected districts of the Capital. Recently restored in 2007, today the Palace retains some of its original Ming and Qing Dynasty Era splendor and is a rather large complex of buildings and rooms interconnected through passages and traditional garden architecture with rockeries and abundant trees. Apart from serving as a museum of traditional architecture the museum also celebrates the art of Peking Opera. It is therefor also known as the Prince Gong Grand Theatre Hall. Regular Opera performances are held, and it is also possible to try on the traditional clothing of Imperial Elite in the bygone past. The deluxe Palace Mansion of prince Gong covers a total surface area of 60.000 square metres. It is composed of three complexes of buildings these conforming to the standard mansion of a prince as dictated by the detailed Imperial Protocol. According to protocol only Royal Estates were allowed three clusters of buildings. The three separate sections of the huge Prince Gong Mansion are the central buildings, and the eastern and western- buildings respectively. In the case of the Prince Gong Mansion however, the total architecture is incomplete as the central Spirit Hall has been destroyed and is missing. The rear hall is a two-story structure more than 180 meters wide, which is said to be 99.5 jian in size. An unusual wooden artificial hill forms the flight of stairs, which gives access to the building. The buildings to the east are constructed in typical Ming style. 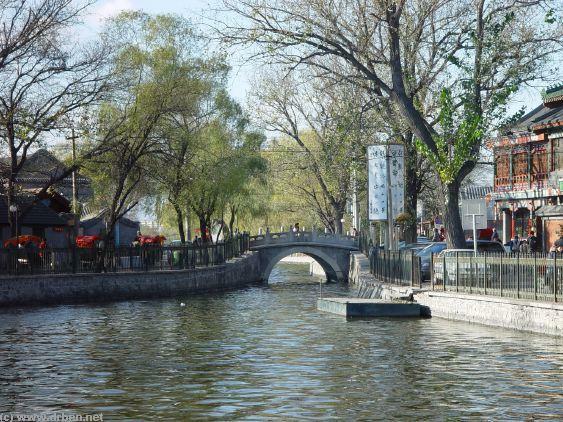 Find the Prince Gong Palace due west of Houhai Lake in the Shichahai (3 Lakes) region of the Old Inner City of Beijing. Technically located in the Xicheng District, the Palace is hidden away in a shady tree lined road located roughly some 500 meters west of well-known Jinding (Silver Ingot) Bridge and the now notorious 'no name bar'. These also provide for the easiest directions on how to actually get there. 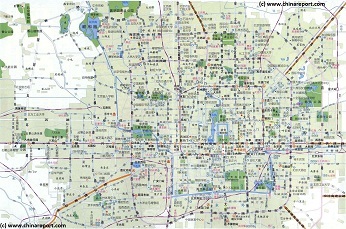 Map of the popular ShichaHai (3 Lakes) area of Beijing Old City with the location of Prince Gong Palace Mansion and other local monuments and sites of interest. 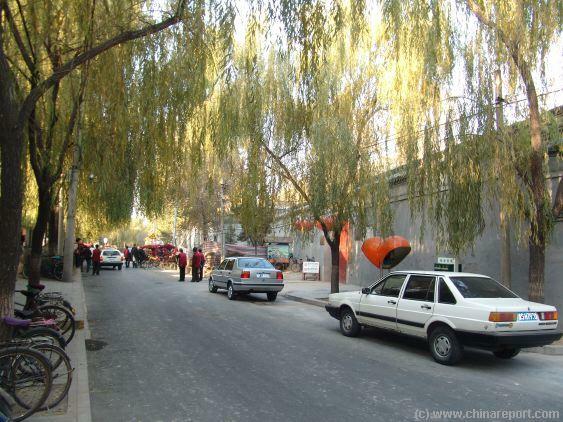 waterside alley and road is the Qianhai Beiyan which, if one follows it, leads via Qianhai West street directly to Liuyin Street and the Gate of the Prince Gong Palace Mansion. Simply follow the waterside road until reaching the Lotus Lane, which is situated to the south off the end of Qianhai Beiyan. Do not turn south into Lotus Lane but keep moving on westwards. Cross two small intersections to land at the south end of Liuyin Street. Follow Liuyin Street around its bend. On the left is a solid grey wall, about two meters height which is the Prince Gong compound enclosure wall. Follow the wall up the street to the Gate which can usually be recognized by its group of rickshaw drivers and tourists. Partial Map of Dongcheng District with in the upper left corner the Shichahai Area and Prince Gong Palace. A view of the Silver Ingot Bridge from Qianhai lake in the South. To get to Prince Gong Mansion, simply follow the direction of the red rickshaws on the Photo. Prince Gong' s Mansion was first built in Iron Lion Alley in the eastern section of Di'anmen East Street, but it has long since moved to its present location. The present Gong Mansion is situated at No. 17 Qianhai Xi(=West) Street which is counted as part of the east bank of Houhai Lake. become the Vice-President of the Board of Revenue bringing him close to the immeasurable wealth of the Imperial Family. The Emperor afterall was the State. 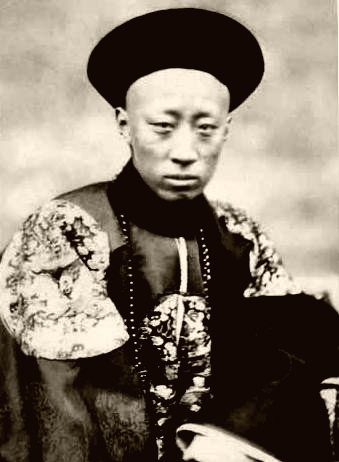 Prince Gong (or Prince Kung) was an important Prince during the 19Th Century turmoils that befell the Ching Empire, as close confidant and ally of Empress-Dowager Hsu Tzi (Cixi) he was responsible for a number of failed Policies during the later Ching Reign and is held -in part- responsible for later defeats of the Ching Armies by colonial forces.He was known by foreigners as a friendly, nice and charming man who was hopelessly inept, completey dependant on the Empress-Dowager, unimaginative, politically weak and somehow always wound up taking the wrong decisions. A Look the Mansion grounds inside though an auxilary gate during the renovations in fall of 2007 AD. his wealth through corruption and became an incredibly wealthy and powerful Man. Inevitably, he also made many enemies, among them some of rivalling powers. Hence, his Life fell short not much after the death of his protector, the Qianlong Emperor. After the suicide of He Shen as ordered by Yongzhen, the succeeding Emperor the property was confiscated by the Imperial Machine and thus befell to the Imperial Family itself. Later during the reign of the Jiaqing Emperor it was given into the care of Prince Qìng Jùnwáng (庆郡王), the 17th and youngest son of Emperor Qianlong. Zhou Enlai as premier during the devastating Cultural Revolution for which he himself was co-responsible. After the establishment of the Peoples Republic of China the Prince Gong Mansion initially stayed as it was but was closed and locked down. 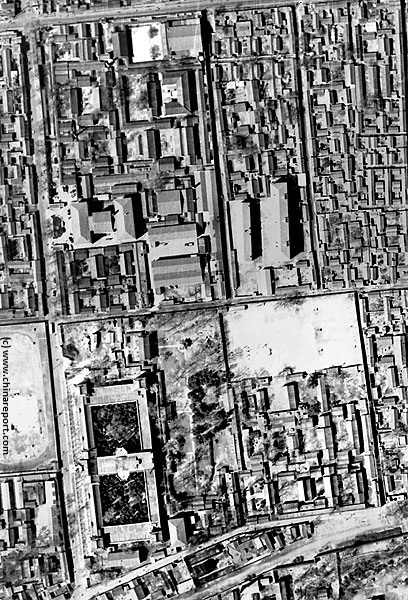 During the Industrial Development of Beijing in the 1950's, the Great Leap Forward (1958) and the disastrous Cultural Revolution Era (officially 1966 AD - 1976 AD) many of Beijing's ancient Monuments were turned to rubble and disappeared forever. 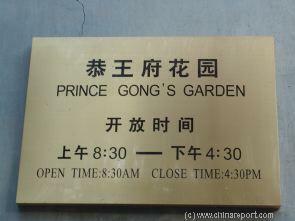 However, not the Prince Gong Mansion. The building complex was confiscated by the Government after which it was used by the Beijing Airconditioning Factory for a long time, allowing the Palace Mansion to survive especially of the campaign against the 'four olds' in 1966 AD - 1967 AD. Apart from its being used practically as a base for a factory another reason for the Mansions survival may be found in its supposed inspiration for ancient classical literature. A criticism of feudalism even. 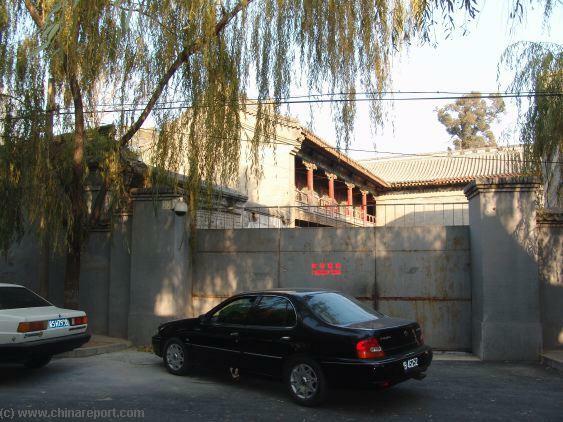 Part of the closed Prince Gong Palace Mansion in November 2007.
it was at Prince Gong's Mansion that Cao Xueqin, author of A Dream of Red Mansions (Hongloumeng), lived the life he was to write about in his famous novel. Researchers believe that the mansion and large garden resemble the Rongguo Mansion and Daguan (Great View) Garden as described in the book. Since certain features described by Cao, including the layout of the buildings seem to concur with the layout of the mansion the majority of enthousiasts agree. This may be the very reason for its survival. 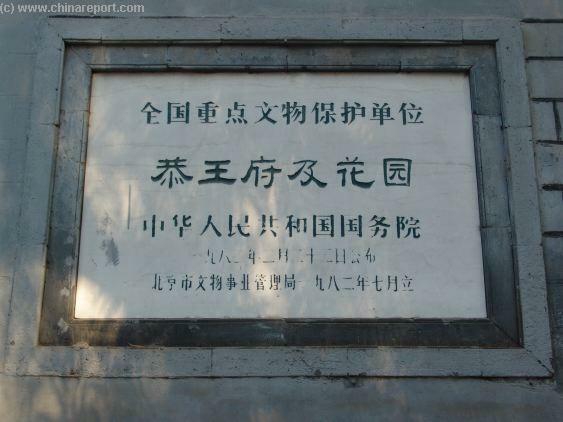 That is, although no official documents or explanation exist from this period, it is known that former Premier Zhou Enlai pointed out that the garden should be preserved as a memorial to Cao Xueqin. 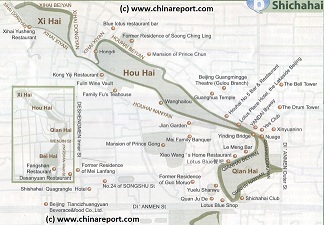 Full Google Map of Prince Gong Palace Mansion site. 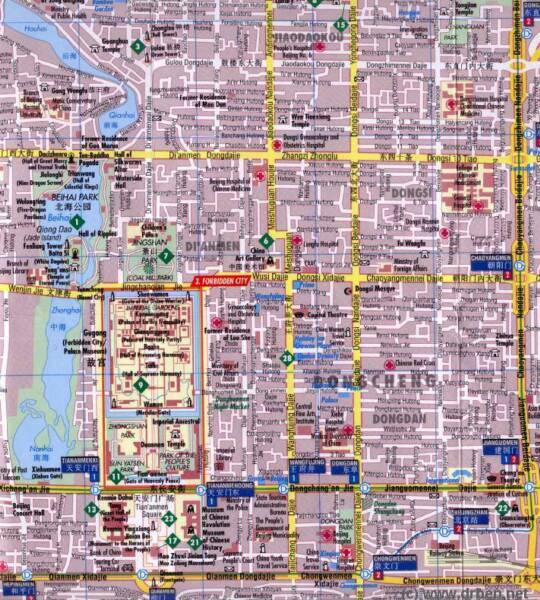 Overview Map of Beijings Inner City showing the location of He Shen Mansion (Prince Gong Palace) as relatively close to the Imperial Palace. meritorious and experienced officials and the second a privilege usually only reserved to the more elderly and highest ranking, He Shen must have been elated. 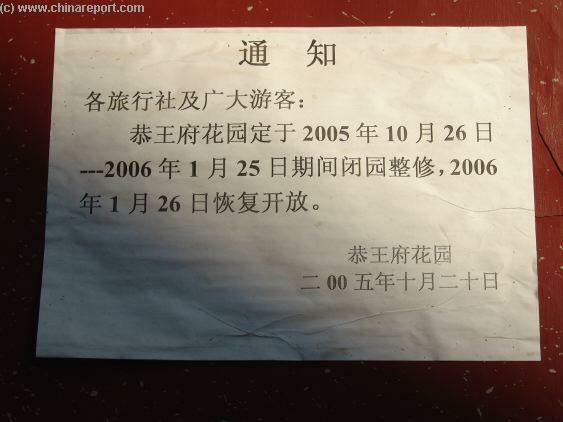 Along with these unheard of promotions went the promise of even larger wealth, and a home in the most prestigious neighborhood in China at that time. The new family Mansion, now known as Prince Gongs Mansion was constructed as a result. Since 2005 the mansion has undergone renovation worth 200 million yuan (Source: Xinhua). In November of 2006 restoration works had started on the expanse of buildings and the process was still ongoing in November of 2007 when the Mansion was closed to the Public. On August the 24Th of 2008 the Prince Gong Palace Mansion was finally reopened to the waiting public under the new name of Gong Wang Fu museum. No longer primarily in function as a Peking Opera Theatre and Venue the renovated Mansion, as the best prserved specimen of traditional royal architecture in the City, will display a variety of Royal items, clothing and aspects of lifestyle, all as experienced by the royal families' during the Qing Dynasty and re-arranged from old photos, official documents, personal memories and the like. Although the Mansion now primarily focusses on explaining the private life of the former royal family members and household, the Peking Opera theme remains as before. Afterall, especially during the lenghty reign of the Empress-Dowager Cixi, Peking Opera became incredibly popular among the upper class and in following of the Old Buddha herself, elite families used to throw parties and organize Opera performances at their private homes in order to entertain their guests. Naturally, the more lavish the costumes, the better the food and the Opera, the more succesful a host would be. The Peking opera house inside the royal mansion not only stages Beijing opera performances, but also other prominent forms of Chinese opera as well. During the initial opening weeks of the newly renovated Mansion Museum in August 2008, the Kunqu performance group from the prestigious "Jiangsu Kunqu House" performed at the Prince Gong Mansion for a week's run with their program Floating Dreams. Among the celebrity audiences who were at the opening including leading American soprano Renée Fleming. After the fall of the Ching Dynasty in 1911 AD, the Mansion remained in the hands of the Family for some time while the former Emperor and his following sought to re-establish their rule or tried to find another way out. While 1921 Prince Gong's grandson had to hand over the property as a mortgage to the Catholic Church. 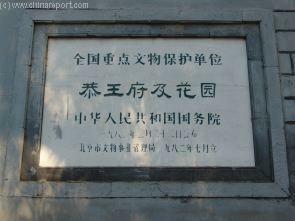 It was bought by the Furen Catholic University for use as a university buildings, and afterwards for the Beijing Normal University and then for the Chinese Music Academy. Officially posted paper notice of closure and renovations at the Gong Wanf Fu. Apart from the mansion there is an impressively large garden. Special features found inside the Garden are the Moon Viewing Hall and the 'Bat' Hall, the later of which is shaped as a wing. Similar to the Imperial Palace itself, the Garden abounds with motifs of Bats, symbolizing in this case the word Fu, which in Chinese can be translated as Bat but also as Good Fortune. Harmonious garden. Inside a cave made inside of a large rockery (another similarity with the Imperial Palace Garden - Yuhuan Yuan) is a tablet bearing the caracter for Fu, upside down. Significantly, the tablet was inscribed by none other than the Qianlong Emperor himself. He gave it as a gift to his mother at a time when she was gravely ill, a small token and wish of good fortune for his beloved Mom. The Empress-Mother recovered soon after receiving the tablet-gift, hence the stone was preserved and for centuries much reveired by the Imperial Clan members. It is unknown why today the stone is not lost but has turned up at this particular location. A highly unusual feature of the gardens at Prince Gong mansion is a short mini-version of the Great Wall of China sought to resemble the 'Elm Pass'. The back section of the Garden has a multi-level hill of Taihu stones with tunnels and a stone with the character fu (happiness) in Emperor Kangxi' s calligraphy. Above there are two large water ponds where lotuses bloom in late summer and early autumn. The small pavilion on top is considered an ideal place for appreciating the moon. A fishing pond stands in front of the hill. A low wall surrounds the eastern courtyard of flowers and trees. Screened by the artificial hill is the Futing (Hall of Happiness), built in such a way that sunlight falls on it from dawn to dusk. It is said to be the only one of its kind in Beijing. The small room to the right of the entrance to the central building of the Mansion was the home of the Family Tutor, usually a hand-picked confucian sage who had starred on his Imperial Exams and had served several advisory functions at Court. The small rooms on the left were rooms that could be occupied by visiting (Male) Guest or used as study rooms. Inside the main courtyard is a large collection of small rooms which served as quarters for the multitude of servants to the Family Mansion. The building was purposely put in the south-west corner of the complex, and as the spot with the least auspicious Feng Shui was designated for Male servants. Much later in 1851 AD the Mansion was given by the Xianfeng Emperor to his brother Prince Gong, after which the Mansion became the official Home of Prince Gong, the 1st (1833 AD - 1898 AD), who is not very well known among the non-Chinese public. Yixin, a.k.a. 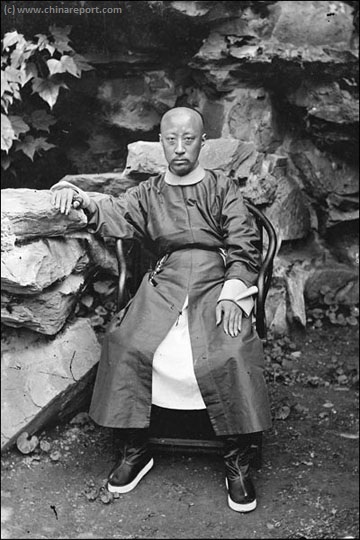 The First Prince Gong as photographed by Felice Beato. Prince Gong the 1st as Photographed among rockeries inside his now famous Palace Garden.